Wool is inherently flame retardant. Being the hair from sheep, wool is a renewable resource. Wool can absorb up to 30% of its weight in water vapor (vapor, not liquid like spills). This makes wool carpet fluff up - rejuvenate itself - when it is steam-cleaned. A synthetic fiber will absorb no more than 1% to 6% and a flattened-down synthetic will generally stay flat. While wool can absorb vapor, it has a membrane that sheds liquid water along with any stain that might travel with the water. Wool is a great insulator, feeling warm in the winter and cool in the summer. When wool holds water vapor it is also less able to create static electricity. Wool is soft to the touch but strong under foot. Modern wool carpet is moth proofed and an amazing property of that moth proofing is that crawly bugs, like scorpions, cannot get across a room of wool carpet without being “proofed” also. 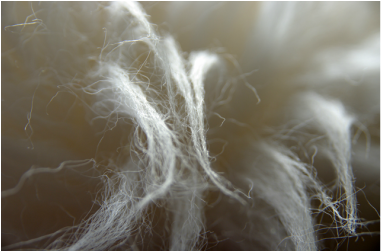 Wool fibers are short - no longer than the hair of the sheep they came from. Several different processes are used to make them stay together [more of that in the next chapter] but in general it is the scales of the fibers that lock together to hold them tight. As fibers on the top of the carpet get damaged or badly soiled, they slip free from their neighbors and are swept up into the vacuum. Thus, wool shedding is a good thing, making for a fresher, cleaner surface with each vacuuming. Synthetic fibers are long (sometimes hundreds of feet long), like a fishing line, and tenaciously stay part of the carpet even when they are soiled, flattened or ugly. A good wool carpet will just wear out after many years. Most synthetic carpets will “ugly out” early but just never wear out. Wool carpet truly wears with elegance. Reason 2: Each of these processes - worsted, semi-worsted, woolen spun and felted - create a different look and feel in carpet and rugs; and each has a different level of response to cleaning and vacuuming. Woolen spun and felted yarns, while they feel better and are thicker than worsted and semi-worsted, have shorter and looser fibers which means that abrasive vacuuming can cause the carpet or rug to fuzz. Bottom line: the best way to vacuum almost all wool carpet and rugs is by adjusting the beater bar/ brush so it is just above the height of the carpet. That way, the vacuum’s suction will remove dirt and lift up loose fibers. The beater bar/ brush will then chop off the loose fibers and leave a smooth, clean surface. Beater bars and brushes were created for nylon carpet which is a tougher fiber and is also a slippery fiber - so that dry soil will slide down to the bottom of the fiber. Thus, a beater bar/ brush is needed to bring up that dry soil. Not so with wool, whose scales hold dry soil close to the surface for easier vacuuming. Allowing a beater bar to dig into your wool carpet is like washing your car with a wire brush – the method is just too harsh for the product. Lastly, do not think that a vacuum with high suction is a good thing. It might be great for lifting bowling balls but it will strip your wool carpet of all the many shorter fibers and make the longer fibers stand up, like a beard. Yes, high suction is generally okay for synthetic fibers, most of which are long, continuous strands of fiber (like fishing lines wrapped around each other). Even then, there are some synthetic yarn carpets that are intentionally made from short fibers (“staple” yarn instead of “continuous filament”) and they will suffer from high suction and abrasive beater bar/ brush vacuuming. Final Note: The cost of a carpet or rug does not indicate its durability or cleanability. There are many fiber and construction choices that are more “boutique” than practical. Just like we buy clothes that we know require special care, but buy them anyway because we like their look or feel, there are trade-offs when we choose a carpet that’s extra soft, a very light color or loosely constructed. Just like with cars and TVs, modern America grew up with nylon carpet. In its earliest days, nylon was pretty much just like a “fishing line”; a smooth, clear, shiny thread. Over the years, it has gone through dozens of chemical and physical changes: controlling static shock, changing the fiber shape so it is less transparent so it will hide soil, treatments of stain and soil repellents, blocking its ability to hold stains and increasing resilience. Because nylon is so strong, carpet made with nylon is the most common choice for high traffic areas like schools, hospitals, airports and office buildings. When fiber strength is very important, such as with ropes used in mountain climbing or water skiing, nylon is the chosen fiber. A nylon carpet will virtually never wear out. Nylon can be dyed to very rich and bright colors. Nylon is very cleanable. Nylon can be extruded into very long fibers, called “continuous filament”, again, much like a fishing line. These long fibers greatly reduce the chance of carpet fuzzing and shedding. Along with nylon carpet came the upright vacuum, with it’s twirling beater brush and high suction. Since nylon is so tough and the fiber is generally long, is can take the abuse of the strong upright, much better than any other fiber. In fact, most brushes in vacuums are made with nylon fiber so when vacuuming nylon to nylon the match is about even; when vacuuming with nylon brushes on wool or most other fibers, the poor carpet is outmatched. Please know that a natural yarn such as wool or cotton is made with short fibers that are spun and held together by mere friction along the fibers’ scales. The result is a yarn that is called “staple” and can never be continuous filament like nylon and many other synthetic yarns. But not every nylon is continuous filament. Some manufacturers still use chopped up staple nylon because it looks and feels more like wool – softer and less shiny. So, it seems like nylon is pretty much the perfect fiber for carpet. It’s tough, dyes to clear colors, resists spills, cleans up well and those ever-stronger vacuums won’t beat it up. Nylon really doesn’t have many downsides to it; but here are a few. The twist that’s put into nylon fiber to make yarn is set with heat – so heat can also take out the twist, like the heat made by the friction of a pivoting shoe, or by dragging something heavy across the carpet, or even by that beater brush on the vacuum. When the twist in the yarn starts to go, the texture of the carpet changes – and, of course, it changes in just a few spots, like the traffic lanes, while staying the same in other areas, making the changed areas stand out. Wool, on the other hand, has a permanent curl, a corkscrew-like twist in the raw fiber. Another downside with nylon is that it will eventually crush, lay flat. Only the very dense nylon loop pile (as in school and hospital carpet) can resist flattening out. Also, since nylon fiber is so clear and shiny it can actually get scratched (imagine walking on a sheet of glass). The areas that get scratched will become dull and the scratches can even hold small bits of color from soil or spills. Thus, the areas of the most foot traffic can become dull or dark compared to the surrounding carpet. This is when it is said that nylon carpet will eventually “ugly out”, even if it won’t wear out. But nylon’s good points make it truly the All-American carpet fiber, one that will take the spills, scrubbing and vacuuming of a busy home. The previous chapter ended with NYLON is “the All-American carpet fiber, one that will take the spills, scrubbing and vacuuming of a busy home”. Nylon fiber doesn’t just go into carpet. We know it makes tough clothing, rain gear, ropes of all sizes and, of course, nylon hosiery. If you can imagine the softness of hosiery vs. the coarseness of a ski rope, then know that the reason for the difference in feel is that the hosiery is woven from very thin fibers and the rope is made of thick fibers. 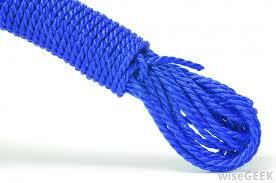 The nylon carpet that goes into schools and hospitals uses a fiber more like what’s used in the rope. Carpet for homes uses fiber that’s a bit thinner and softer. The new soft nylon carpets use fibers that are more like the hosiery nylon, very thin and much softer. The measurement of fiber thickness is called “denier”; so the fiber that makes soft carpet – and hosiery - is called “fine-denier” nylon. This is actually the second time around for fine-denier carpet. The carpet industry tried it about 30 years ago. The appeal of soft carpet is that it has a great “hand” to it. Hand is how it feels when you run your hand over it or, for everyday use, your bare feet. After that, though, there’s not much else to boast about. In fact, soft nylon carpet has a few drawbacks vs. regular nylon carpet. Because the fiber is so thin, it cannot hold up as well as a thicker fiber – it can crush much easier. The individual fibers that make up a strand of yarn do not have the same resistance to breaking - not the same “tensile strength” – so they can break off when a tough vacuum is used. Some carpet manufacturers declare than they have compensated for the thinner fiber by putting more strands of fiber in each twist of yarn. That still does not make for a carpet that won’t crush – mat down under foot traffic – and lose fiber to the vacuum. In fact, more fibers in each strand of yarn means that there is more surface area to hold onto soil. Soft carpet is the latest rage – and manufacturers are competing to make it softer than the other guy’s carpet. But when choosing soft carpet, there is a trade-off that has to be made. It can be soft but it cannot also be durable. Then what about all the fantastic warranties the mills are offering with their nylons and soft nylons? You must understand the meaning of each warranty and view the fine print to understand what is going on. The original wear warranty of nylon means that the nylon fiber will not break off and lose more than 10% of the original amount of fiber, over a certain number of years. That pretty much never happens with nylon; so that warranty is unnecessary. Then there are stain and soil warranties of all kinds, anti-static warranties and warranties against defects in making the carpet. The one that comes closest to covering a soft yarn is called “texture retention”. One version of this warranty says that the yarn will not show excessive pile crush or matting as a result of tufts losing their twist. For soft yarns, it is not the loss of twist that is the main reason the pile crushes. It is simply because the fine fibers cannot remain standing upright. Other carpet brands offer a warranty that promises texture retention without calling it loss of twist in the carpet tufts; but then they actually exclude matting and crushing from the warranty. This all really means the same thing: there are no carpet warranties that promise your chosen carpet will not show footprints, vacuum tracks, traffic patterns and permanent crush marks. So it comes back to what to expect from your decision to buy very soft carpet. You can expect a great, soft feel but don’t plan on the great look lasting for very long. Besides the all American Nylon, there are several other fibers that are woven or tufted into carpet. The most commonly used are Polypropylene and Polyester, which are quite often mistakenly grouped under one nickname: “Poly”. Polypropylene, also called “olefin”, has the amazing property of repelling liquid, which means it also repels any color that might be with the liquid – it just won’t stain. Because it won’t stain, it cannot be dyed as a fiber; so the color of the fiber needs to be added while the olefin chemical is still a liquid. The name for this is “solution-dying” and the solid fiber that is extruded from the solution has its color all the way through it, like a carrot. All other dye methods for carpet fibers put the color on the outside of the fiber, like an apple. In addition to being extremely resistant to stains, solution-dyed fiber is colorfast, it resists fading by sunlight or by bleach. It can be cleaned with strong chemicals without affecting the color. This makes it a popular fiber for school and hospital carpet. However, olefin is not as refined as nylon; literally, in the refining process from oil to fiber it does not go through as many steps (as nylon) to make it. Fewer steps result in a less expensive fiber; but since it is closer to a barrel of oil than nylon it has a few bad properties. It allows oils to cling to it, and gives them up only with strong detergent shampooing. This would be oil walked in from our parking lots, body oil, grease, sunscreen, cosmetics, etc. The best fiber for walk-off mats at an office building is olefin because it grabs oils from shoes before they are carried into the building. Olefin fiber has a lower melting point than nylon which is not a terrible problem except if there is high friction across the carpet surface, like Johnny sliding into “home plate” in the family room or if you quickly slide that glass table top (on end) while moving the table. The friction from these activities can actually melt a path into the carpet. Being softer than nylon also means olefin will not bounce back as well from foot traffic. The other “Poly”, polyester, has been around a long time. It came on strong in the 70’s but lost out to nylon because polyester carpet would crush (pack down) so easily. During my first week on the job, in April, 1972, with a carpet mill called Berven, I visited a home to inspect a claim of crushed carpet, made with the old Kodel Polyester. I looked at it and agreed with the home owner that something was wrong. I returned to the office to report my findings to my boss. He straightened me out right away: crushing is a character of polyester carpet and cannot be a valid claim. It was another five years of turning down claims before I no longer had to deal with them; polyester was gone from the carpet market. Well, it’s back! Here’s what’s different: 1) some polyester carpet fibers are made from recycled water and soda bottles, 2) some are made with oil from corn, 3) they’re making a lot of the polyester carpets in dense constructions with tightly twisted yarns. Differences #1 and #2 appeal to our ecological sense; recycling pop bottles is great and keeps the cost down. Using corn oil instead of crude oil or coal tar, like with nylon, is great for the environment but doesn’t keep the cost down. The real important difference this time is #3, the carpet is made better than it was in the 70’s. There are great features of polyester such as its great feel, a soft “hand”. It can also achieve clear and bright colors and, like olefin, can resist many stains and is good at resisting fading. There is one other synthetic fiber that we see occasionally in carpet, Acrylic. We find it more often in clothing with brand names like Acrilan or Orlon. Acrylic looks and feels like wool, mostly because it is cut up into short fibers (staple) like wool. Because of this, the short fibers will break loose (fuzz) and ball up (pill) on the surface (like an acrylic sweater) which makes for an unsightly carpet in a very short time. Acrylic is best used in carpet as a blend, such as with wool, to bring down the cost of the carpet. The Sunbrella brand of acrylic fabric is solution-dyed, like olefin, so it is very fade-resistant. Some outdoor rugs are created by braiding the fabric and weaving or stitching it together. All synthetic fibers are designed to emulate the best properties of wool: resilience, soil-hiding, softness, flame-resistance and low-luster. They all absorb less water vapor than wool, meaning they won’t hold stains and have a greater tensile strength (won’t break as easily) than wool. They all resist fading better than a dyed wool yarn [except a natural, un-dyed wool yarn is very fade resistant]. And, of course, the synthetic fibers cost less than wool fiber. Carpets and rugs made from plant fibers account for a very small portion of the U.S. market. They are used more widely for soft flooring in developing countries and in the countries where the respective raw material is grown. Just like for clothing, shelter and coverings, plant fibers have been woven into flooring for many thousands of years. Sisal is the most common-used name for plant-based rugs and carpet. We normally equate sisal with its dried and un-dyed color of golden brown but sisal can actually be dyed into very rich colors. Sisal is made by removing the fibers from the leaves of the Agave Sisalana plant. The plant renews the leaves and is generally harvested every 7 years. Sisal fiber is strong and stiff, and feels coarse to the hand (or foot). It can be combined with other fibers, like wool or cotton, to soften the feel. Since sisal is so easy to dye, it is also very easy to stain. Even plain water can darken the look of the fiber. Seagrass is a flowering plant that grows in shallow sea beds or in cultivated fields that are flooded with seawater. Unlike sisal, seagrass is impervious to moisture, so it cannot be dyed and it will greatly resist staining. It is also smoother and softer than sisal but not nearly as strong. The fiber is quite slippery so is does not spin into tight yarn bundles like other fibers; resulting in a large, loose weave. Even though the fiber is resistant to staining it will hold moisture close which can contribute to the growth of mold or mildew, but an unlikely occurrence in our desert climate. Jute is the best of both worlds; softer than sisal and able to be dyed. It is harvested from the leaf skin and stem of the Corchorus plant, laid out to dry, then spun into the desired yarn thickness. In carpet, jute is used more for the backing than the face of the carpet, and in rugs it is more often the yarn through which the face yarns are woven. But in some designs, jute is either the main fiber or is combined with another fiber, like wool, to make interesting colors and textures. Coir comes from the husks of coconuts. It is tough and durable, quite scratchy to the touch – which is why it makes good door mats, a.k.a. coco mats. But the fiber is brittle and will bend to a point, then it breaks – that’s why a coir door mat wears down fairly fast. Coir can be easily stained from spills and, like seagrass, its yarns do not bundle tightly - making for a looser, slippery surface. Abaca is harvested from the long leaves of a banana plant – inedible bananas. Each fiber can be 6’ to 12’ long and when spun together make the strongest yarn of any plant fiber. It is used to make hawsers (ships’ ropes) and fishing nets. Like sisal, it can be dyed to rich colors but it has a reflective shine much like silk. Cotton makes great bath mats, towels and clothing because it absorbs moisture so well. Cotton dyes to rich, long-lasting colors that can be cleaned over and over. Of course, since cotton is so soft, it does not wear well under foot and because it absorbs everything, a cotton rug will always need cleaning. One property that is common to all plant fiber rugs or carpet; when they get wet they will expand and when they dry they will shrink. For all the above except cotton, that shrinkage makes for a smaller rug or carpet than what you started out with. All the negatives aside, there is no synthetic fiber that can achieve the natural look and feel of plant fiber carpet and rugs. They are a statement that you care about the environment and cherish things from the earth. Silk yarn makes the most beautiful, durable – yet in some ways delicate – rugs and broadloom. Just like with apparel, interior fabrics and linens, being made from real silk is a sign of quality and high fashion. Real silk, of course, comes from the silkworm; but did you know that it is spun by the worm as a covering for its cocoon, which generally is the size and shape of a small egg. When harvested, the cocoon “egg” is boiled in water, then a loose end is found and the silk is able to be unwound from the cocoon onto a spool in one, continuous strand without the fiber breaking – right down to the last inch. A strand of nylon that thin would snap over and over if it went through the same process. Then, a large number of silk fibers are spun together into thread or yarn. Real silk has a unique luster, but it’s not really shiny. The dyed colors are rich and clear with a subtle glow. And its softness is unmatched by any other fiber. But silk can be tough to take care of; cleaning methods need to be delicate. The fiber is weaker when it’s wet and if stretched it won’t snap back. Direct sun can cause colors to fade and the fiber can break down. In spite of these issues, a well-made and well-kept silk rug can last for hundreds of years. Silk rugs have been found in tombs dating back as long as 2,500 years and are perfectly beautiful and usable. Faux Silk: Many plant fibers can be processed to look and feel like silk. The most common fibers are cellulose-based (from wood pulp or cotton). Cellulose is the main source of paper. But to make fiber it is made into a liquid, called viscose, extruded into fibers (through a nozzle much like a shower head) that are then spun into yarn. The first artificial silk was Rayon. Another that has been around a long time is mercerized cotton. Many other plants are used as a source of cellulose to produce faux silk; such as bamboo grass, banana trees or soybeans. Faux silk is also called banana silk, bamboo silk or “art silk”, short for artificial silk. All offer the look and feel of real silk but they are best used as accent colors or small parts of a design mainly because they are so ill-prepared to receive moisture. When dampened, the fibers swell up and “bloom”. They do not fully recover when dried and can be further distorted if rubbed when trying to dry them. From then on, those fibers will always look different than the surrounding fibers, usually darker as if they were soiled. Imagine leaving a sweat ring from a glass on a piece of paper. No amount of drying or blotting will make it disappear. The texture and apparent color in that spot will always be different than the rest of the paper. That’s what happens to faux silk when dampened. While silk and faux silk have serious drawbacks with regard to getting wet, they do make for an elegant luster in parts of a carpet or rug; and they have a genuine softness that cannot be matched. For overall softness, if desired, the best use of silk or faux silk is to blend the fibers with wool – no less than 50% wool. This will create a very soft carpet or rug and the wool will protect the weaker fiber from showing color or textural change when dampened. Fiber choice is just part of what makes a carpet or rug unique, durable or delicate, easy to clean or tough to take care of. Another important part of what makes it look or perform in different ways is how the carpet or rug is made - tufted, woven, knotted; is it loose or dense. I hope to be able to talk about carpet and rug construction in another article.